Croeso i Dolronwy - A warm welcome to Dolronwy in Dolgellau, where we have 2 ensuite rooms in our annex. 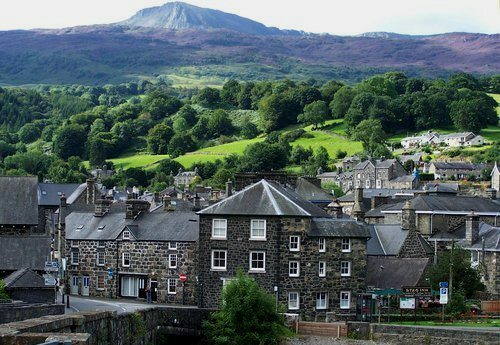 Nestling at the foot of the Cader Idris mountain range in the Snowdonia National Park, Dolronwy is quietly situated in the oldest part of Dolgellau town, called Y Lawnt. We are just a two minute walk from local restaurants, coffee houses, pubs and shops. If you are looking for accommodation in Dolgellau, you can be certain of an excellent stay with us. Cycle/motorbike friendly, with garage lockup! We have extensive private off-road parking to the rear, cycle lock up and room in the double garage for motorbikes. Both of our letting-rooms have flat screen TV/DVD players, tea & coffee making facilities, a chillbox, crockery and en-suite shower facilities. Most of our complimentary suppliers for Dolronwy are local and provide us with the high quality products one would expect from people who, like us, have a passion for their work and reputation. Dolronwy also strives to source FairTrade provisions wherever we can, including our teas and coffees. Escape from the hustle and bustle of everyday life, to the relaxing and inspiring surroundings of Southern Snowdonia. Whatever your needs; adrenaline-charged bike rides, tranquil river walks, challenging hill climbs, fun beach days, romantic meals, or facinating historic visits - Dolronwy has it all here in our little patch of paradise. Dolronwy in Dolgellau aims to help meet all the expectations of your holiday in this wonderful area.